We had spent most of the time this day in the more than 2000 years old ruins of the Empuries. On our way back we had a short stop in this Canal town and Holiday resort Empuriabrava outside of Roses. It was natural to think: What will this place look like if it is excavated 2000 years into the future. 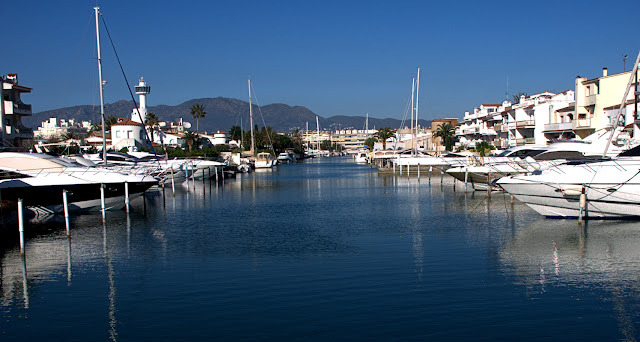 Empuriabrava (Ampuriabrava in Spanish) is one of the most unusual towns along the Costa Brava. Sporting nearly 24 kilometers (15 miles)1 of canals, and 5,000 private jetties, Empuriabrava is the largest residential marina in the world. For most of us that means it provides ample opportunity to gawk at how the rich and richer spend their money: in this case on expensive houses and yachts. If you’re into the type of town where you can have a romantic stroll along picturesque streets, or enjoy tapas at an old bar where you mingle with the locals, this is probably not your cup of tea. There’re almost nothing authentically Catalan about the place (which, after all, is only about 40 years old). Those are the primary reasons why we ourselves would not consider vacationing here — even though we have visited the place several times, usually while on our way back from Cadaqués. 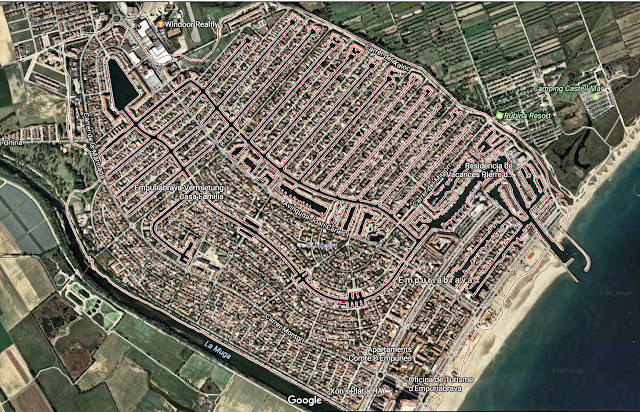 That said, reminiscent of Venice or Miami Beach, Empuriabrava is a major, upmarket tourist destination. It is particularly popular with Germans and the French, and — to a much lesser extent — Dutch and British visitors as well. Many tourists and day-trippers rent sailboats or motorized boats, or at the very least take a canal boat tour. And while Empuriabrava itself doesn’t have much history or, for that matter, charm, the old cities of Figueres (15km), Girona (55 km) and Cadaqués (23km) are nearby. The French border is, at 40km, close as well. Center to center, Roses is only a 9km drive, proviving ample restaurants and bars. Like we said, no building in the place is over 40 years old — but if you do need to see old buildings in a setting that still evokes that old Catalonia feeling, you can always visit the small, medieval city of Castelló d’Empúries — of which Empuriabrava actually is a suburb. While they’re only 2km apart, the contrast between the former — which dates back to the ninth century — and the latter couldn’t be greater. Get this: barely 40 years ago, all you would see at this spot was a wide expanse of swampy coastal land with, to the North, the town of Roses overlooking the bay. The land — interspersed with salt marshes, lagoons and wetlands — was shared by five large farms and some smaller ones. In the 19th century this area was an important source of wheat, corn and alfalfa. During much of the 20th century, the focus shifted to cattle farming — providing meat for markets up and down the coast, as well as livestock for what was then an important cattle market at nearby Castelló d’Empuries. We’ll take a closer look at Castelló d’Empúries in a separate entry. For now, just note that the much larger Empuriabrava actually is a suburb of this small town (population: 4.000). In December, 1964, a company named Eurobrava SA (later Empuriabrava SA) came up with a plan to create an international flying club, along with a residential community. The company was run by three businessmen, including the owner of four of the five large farms. The plan was formally presented to the town hall of Castelló d’Empuries in June, 1965, and immediately met with the vocal opposition of most owners of the smaller farms in the area. Mind you, this was a different era — in which planning committees, zoning maps and environmental protection laws played little to no role. No developer in his right mind would say that kind of thing nowadays, but even back then the plan was very controversial. Small wonder that there was no love lost between the town hall and the developers, particularly when it turned out that — just three months after submitting their plans — the latter had already commenced, illegally, with the construction of roads and canals. That the plan was nevertheless approved, in June 1967, is largely due to the fact that during the 1960s Spain was experiencing its first tourism boom. The development company, now named Empuriabrava SA, had cleverly launched an intensive marketing campaign aimed at tourists in Germany, France, Belgium and The Netherlands. Whereas officials and others initially thought their district had nothing much to offer to tourists, the enthusiastic response to this ad campaign opened their eyes to manifold financial opportunities. As a result, the developers were forced to scale down their plans. For instance, the planned construction of a canal to Figueres — 18 kilometers (11 miles) inland — was scrapped. Nevertheless, in 1980 the project was in crisis, and in June that year control of Empuriabrava passed from the developers to the town hall of Castelló d’Empuries.